Currently, I work with a non-profit organization (www.phinizycenter.org) that conducts continuous river monitoring along the Savannah River and surrounding oxbows. 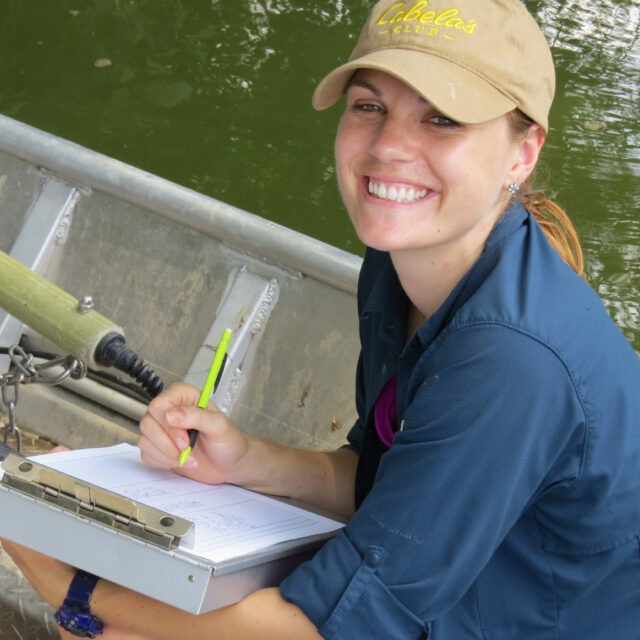 I am interested in investigating diatom assemblages in the Savannah River and constructed wetlands as biological indicators for water quality and levels of eutrophication. My background is in Tropical Ecology and past research included: assessing anthropogenic impacts of endangered endemic species, White-breasted Thrasher (Ramphocinclus brachyurus brachyurus), territories, modeling tropical tree growth and survivorship across different reforestation regimes, evaluating carbon sequestration in tropical soils and above ground biomass in areas of regeneration, and using allometry to quantify tree reiteration. In all my adventures, never have I been able to travel along the Southeastern coast, explore rivers, and travel through time ~12 million years in one afternoon. At lakeside Lab, we have been able to do this with diatoms in a single drop (or two) of water! I can't wait to learn more about them! !